SMBs doing business globally face some hurdles which are less common in domestic business. One which seems to either raise inordinate concern....or be largely overlooked is the risk of corruption. Many assume that the risk is primarily to large companies with large global sales to foreign governments. That's an overly simplistic view. In fact, anti-corruption efforts are gaining momentum globally. The US FCPA is relatively familiar, and the UK and Canadian anti-bribery acts are well publicized as well. But even emerging markets are joining the effort to reduce corruption - many have recognized the disastrous impact on economic development. So companies of all sizes with global sales should understand the exposure and take specific and deliberate steps to mitigate risk and prevent corrupt business practices. 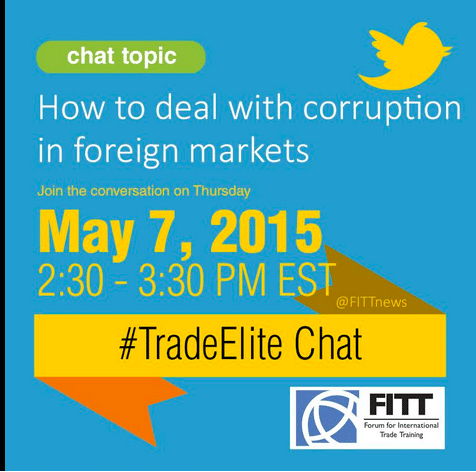 A recent #TradeElite tweetchat hosted by the Forum for International Trade Training featured a wide-ranging and lively discussion with various recognized experts on corruption, bribery and risk mitigation for global sales. Wondering how to manage the challenges of export growth? Download our free whitepaper on selecting the right export advisor.